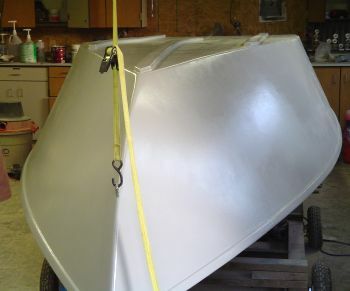 6-8-04: On 5/29/04 I completed painting the bottom and sides. I will let it dry for a week then turn back over and start to prime the inside and paint. I used the system three water based epoxy primer and WR-LPU topcoat paint. 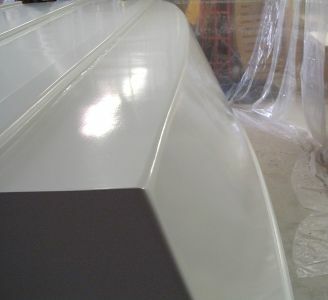 the primer was rolled on (3 coats), then sanded smooth. 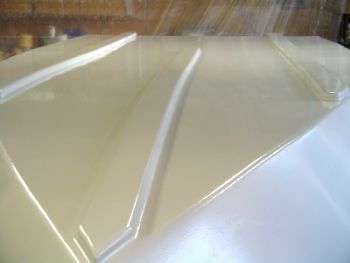 The paint was applied with a spray gun for the first three coats. I couldn't get it to lay right so I rolled the next 2 coats and tipped it with a brush. Came out excellent. I want to be ready for the water in July sometime (might be a little optimistic).